76 Comments	This post may contain affiliate links. 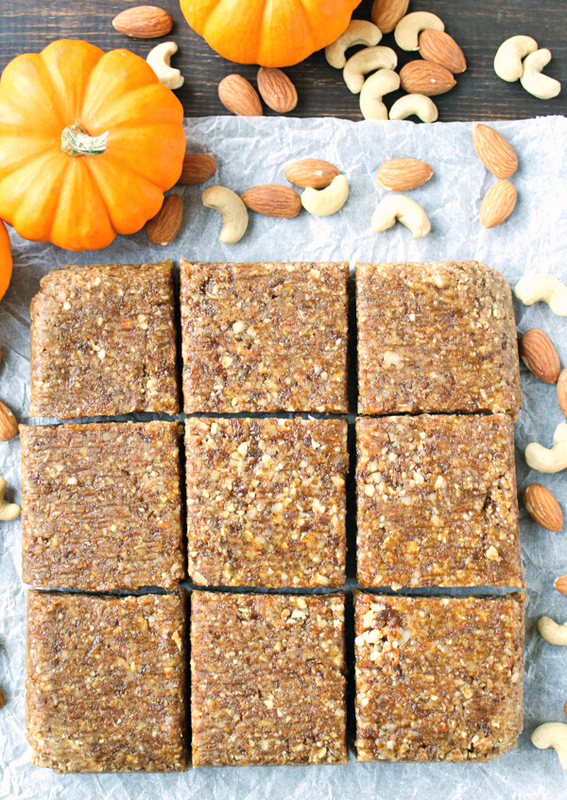 These Paleo Pumpkin Protein Bars are a copycat version of the seasonal RX Bar. 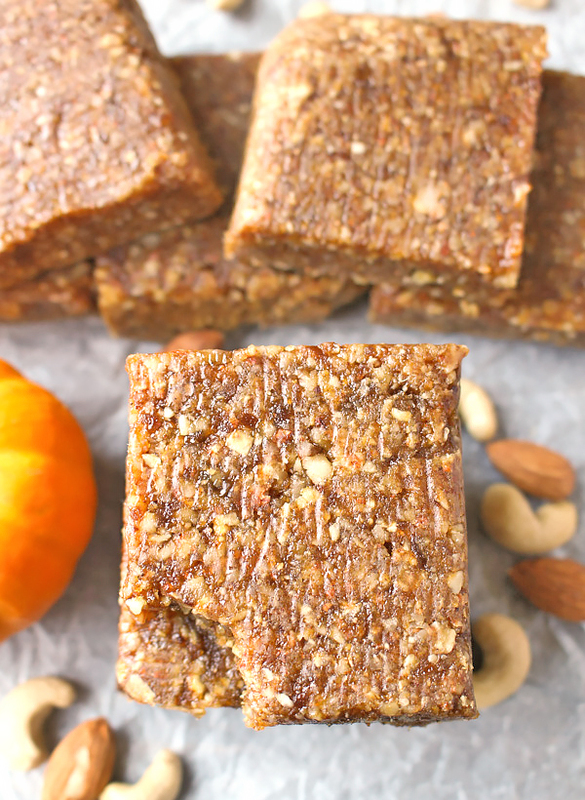 No-bake, made with all simple, healthy ingredients, and so delicious! Whole30, gluten free, and dairy free. These are the third RX Bar copycat I’ve made. There’s the Chocolate Sea Salt and the Sunbutter Protein Bar (PB copycat) that are both just as easy and good for their own reasons. These have the distinct pumpkin flavor from the pumpkin pie spice and have actual pumpkin in them. Yum! They are made completely in the food processor and it only takes a few minutes. They can be eaten right away, but are best refrigerated first because they firm up more. 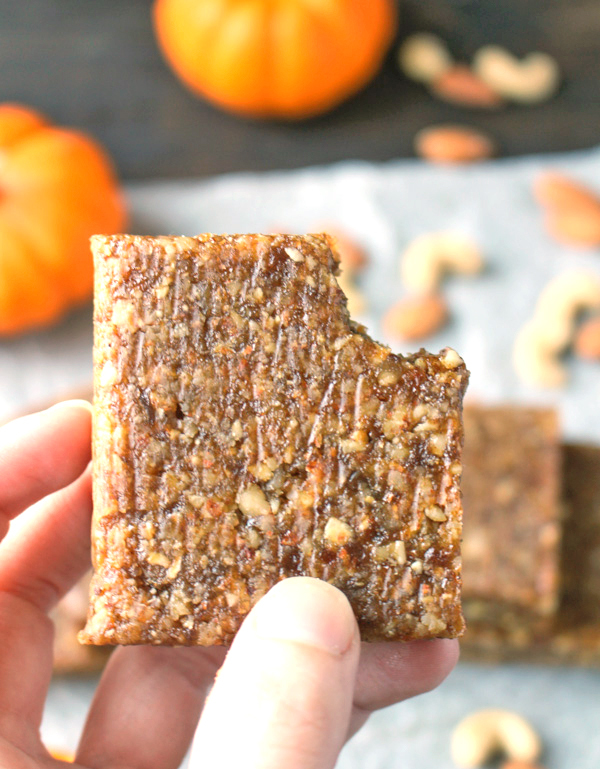 These are Whole30 compliant since they are just sweetened with dates. I love the original bar, but I think these are actually better. They are softer and don’t stick to your teeth as much. I don’t usually post nutrition facts for my recipes because I don’t count calories or fat, but here is the comparison of these to the store bought kind. This is if the bars are cut into 9 squares. Pretty good! Especially considering they can be made any time and you do not have to wait for them to come out in the fall! 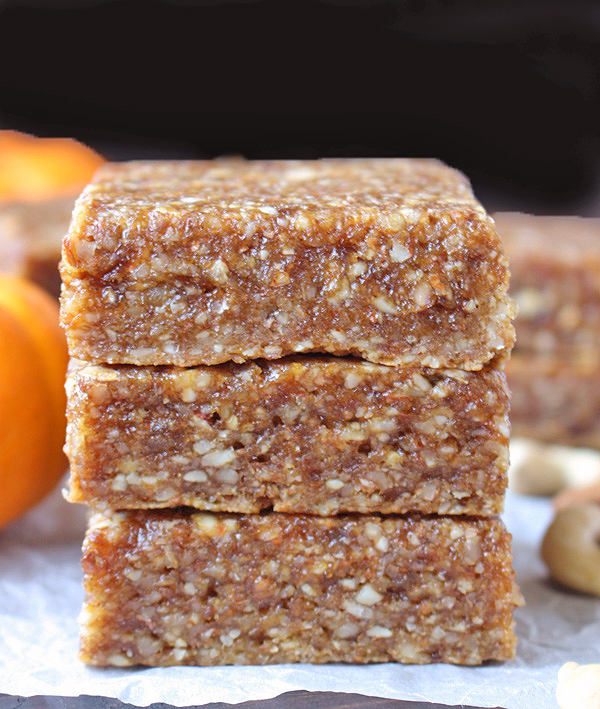 The pumpkin spice is perfect in these- definitely there, but not overpowering. The original bar uses egg whites as the protein and I have used that as well, but I also like using collagen peptides instead. It has more health benefits and I like using it whenever I can. It’s completely taste free so you can’t tell the difference. 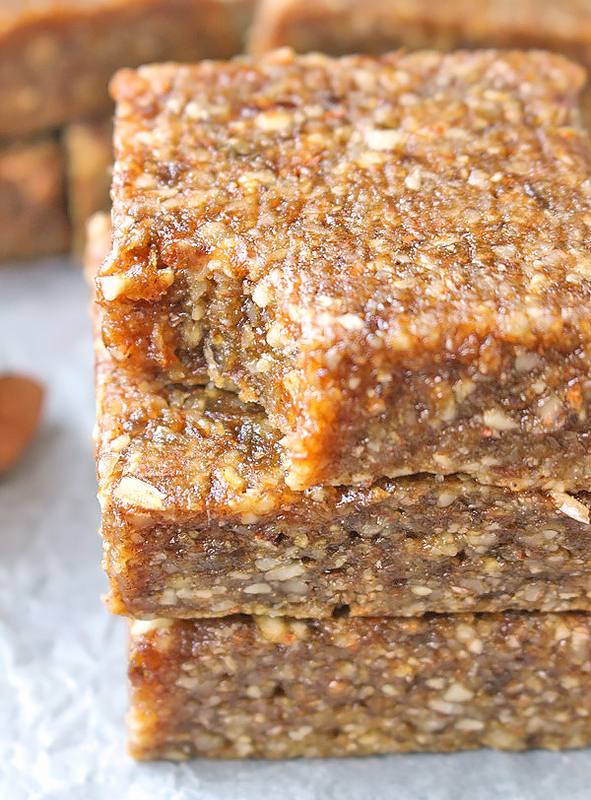 You will love this homemade version of the popular bar. They taste amazing, are soft, chewy, and make a great snack. Here are the other 3 flavors again: Chocolate Sea Salt and Sunbutter Protein Bar (PB Copycat), and Apple Cinnamon Raisin. Line a 9 inch square pan with parchment or wax paper. Set aside. Combine almonds and cashews in the food processor and turn on until they are roughly chopped. Add in dates and process until combined. The mixture won't be smooth. Add in the egg white powder, pumpkin spice, salt, and pumpkin and process until mixture comes together. This may take 3-4 minutes. Stop and scrap down sides as needed. Press mixture into pan as evenly as possible. Refrigerate for a couple hours, then cut into 9 bars (3x3). Store covered in the fridge for best texture. I love how easy these were to make! Have you ever tried substituting hemp powder for the egg powder? Thanks for trying them, Sharon! I haven’t and I think that would affect the flavor. You can always try it though! I made these this morning. Waiting for them to firm up, but did taste them. SO good! It’s a messy process, but woth it. Thanks so much. You’re welcome, Karen! Thanks for trying them. Yeah, cleaning the blender is the worst part!! I LOVE this recipe and the chocolate sea salt recipe – I’ve shared this link with several friends. I have a question – the second time I made it, it came out stickier than the first – I used canned pumpkin from the fridge (it had already been opened) and collagen peptides. Do you think either of these would have caused it to become stickier? Thanks, Megan! I’m so glad you like these. That’s weird- I don’t think that should affect the stickiness. Maybe the pumpkin was waterier? I’ve made them many times with collagen and it works the same. You can always add a little more collagen maybe? I have also had people bake them which helps dry them out. Hope they’re still tasty. I love your recipes! Maybe I mixed it too much but the texture is more Larabar to me. Very delicious! Thanks, Kelly! 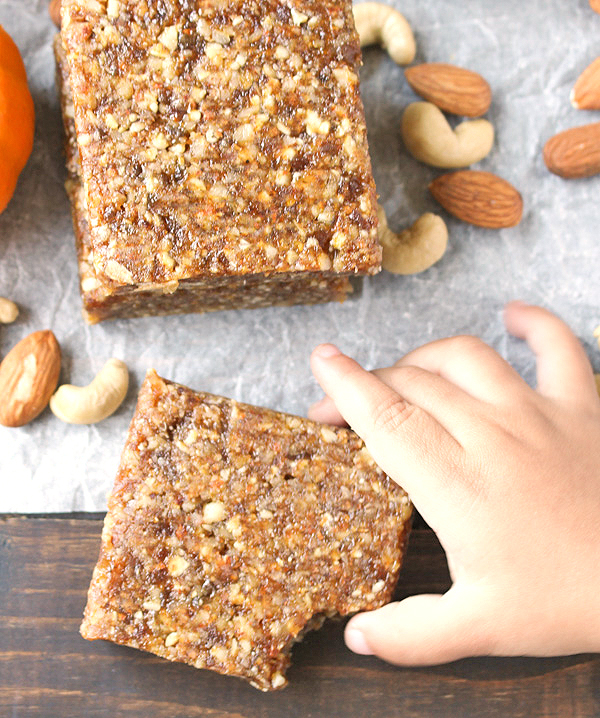 They are more blended than an RXBAR, but I still consider them a copycat because of the ingredients. Glad you like them!